If it is true that the Christian Europe of the Middle Ages was shaped by monasticism, more so it can be said of the Ethiopian Christianity. Ethiopia converted to Christianity around the year 330 through the work of two Syrian young brothers who were taken prisoners in the Red Sea and brought to the court of Axum, where they reached a prominent position. They instructed the young prince Ezana in the Christian faith, who later declared Christianity the official religion of the state. One of the two brothers, Frumencius, went to Alexandria in search of a bishop for the incipient Church. To his surprise, he himself was consecrated bishop by St Athanase. The Ethiopian Church venerates him as its founder and gives him the names of Abuna Salama and also ‘Kesete Birhan’, the Revealer of Light. It was not, however, until the end of the fifth century and beginning of the sixth that evangelization spread outside the capital. It was mainly the work of the so-called ‘Nine Saints’ or Tsetegn Kidusan, who were monks from various parts of the eastern Roman Empire (Byzantium). Some of them, such as Alef, Afse or Tsegma, are supposed to have come from Syria, while others, like Aregawi, Pentelewon or Likanos, came from Constantinople. It is believed, however, that all passed through Egypt, where they were influenced by Egyptian monasticism. From there they brought the Rule of San Pacomius, which they translated into Ge’ez and which served as a main reference to Ethiopian monasticism, without however losing the strong Syrian reminiscences, visible above all in the tough penances so typical of Ethiopian monks. The Ethiopian tradition speaks of another group of monks who also came from outside the country during the same period. They are known as the ‘Just’ or Tsadekan, to whom the founding of other monasteries is attributed. In Ethiopia we find, throughout history, the two main forms of monasticism: the eremitic or solitary and the coenobitic or communitarian. The Nine Saints lived in Axum for a short time, but they soon dispersed in the countryside, founding each one of them a monastery that was a focus of evangelization of the surrounding areas. The most famous of all is the monastery of Debre Damo, founded by Aregawi, the Elder. His fame comes first from its location on the top of a mountain almost inaccessible, with its flat summit in the form of a table, and second from the role it played in Ethiopian history. The monasteries founded by both groups, the Kidusan and the Tsadikan, were like the seed of a series of monasteries that spread throughout the nation, to the most distant borders, helping to define the limits of the Christian empire. They usually chose the most rugged, but at the same time, the most picturesque places: inaccessible and challenging mountain peaks, deepest valleys. Debre Damo, Debre Bizen, Debre Sina, Zuqwala, Waldebba, Gunde-Gunde or the islands of Lake Tana are but a few of the most notorious examples. The monks influenced all aspects of the religious and civil life of the nation. Their intervention in politics could be decisive, as it was, for example, in the restoration of the so-called Solomonic dynasty in the thirteenth century, through the mediation of Abuna Tekle Haimanot. The 12th and 13th centuries are particularly important in the development of Ethiopian monasticism with the appearance of great monks such as Jesus Mo’a (+1287)), founder of the monastery of Hayk, Tekle Haimanot, founder of Debre Libanos, and Ewostatewos (1273-1352), promoter of a monastic reform alternative to that of Tekle Haimanot. 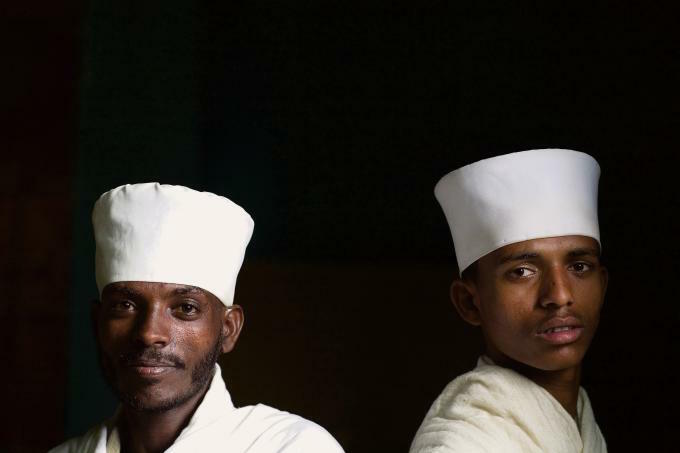 In fact, Tekle Haimanot and Ewostateos represent the two most important currents of Ethiopian monasticism. The one of Ewostatewos, more rigorist, spread mainly in the monasteries of the north (Tigray and Eritrea). The one of Tekle Hiamanot, more moderate without ceasing to be austere, spread in the monasteries of the south (Amhara, Gojjam, Shoa). Some of the positions of Ewostatewos, such as the observance of the Sabbath in addition to Sunday, were considered by many as heterodox and were condemned by Patriarch Yakob. Due to the opposition he found, Ewostatewos left Ethiopia and went to Egypt, the Holy Land and Armenia, where he probably died. But his disciples persevered in the same line, which eventually gained the support of Emperor Zara Yakob, who in 1450 imposed the observance of the Sabbath throughout the empire. The differences, and even rivalries, between monasteries had many manifestations, some of them beneficial, like contributing to a greater push to evangelization. Thus, the monastery of Hayk, in order to extend its influence, undertook the evangelization of the populations to the west of its monastery, reaching to Lake Tana. Likewise, the monastery of Debre Libanos evangelized the southern areas, reaching Lake Zway and the Kafa region. Another manifestation of their rivalry, this one less beneficial if not harmful, was the bitter and largely sterile, dispute over the anointing of the humanity of Jesus, which deeply divided the Orthodox Church as a whole during the eighteenth and nineteenth centuries. While the monasteries of the north aligned themselves with the sect called karra (knife), those of the south, led by Debre Libanos, aligned with that of ye-tsegga-lij (son of grace), also known as sost lidet (three births). The dispute finished towards the end of the 19th century (1876), due to the intervention of Emperor Yohannes IV, who imposed the formula of the karra sect in all the country. The deep changes which took place in Ethiopia in recent times, starting from the revolutionary Marxist regime of Mengistu Hailemariam (1974-1991) and followed by the spreading of modern education and the sweeping growth of the Protestant Pentecostal-type denominations necessarily had a deep impact on the Ethiopian monasticism, still very much anchored in its old traditions.